There's a great temptation to think that the goal of any and all true renewal in the Church should be to return to the exact life and practice of the early Church. 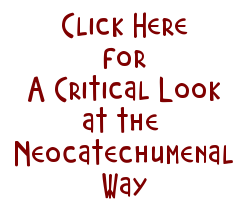 Even movements within the Catholic Church, like the Neocatechumenal Way, have fallen into this particular trap, which goes by the names of "Restorationism" and "Christian Primitivism." 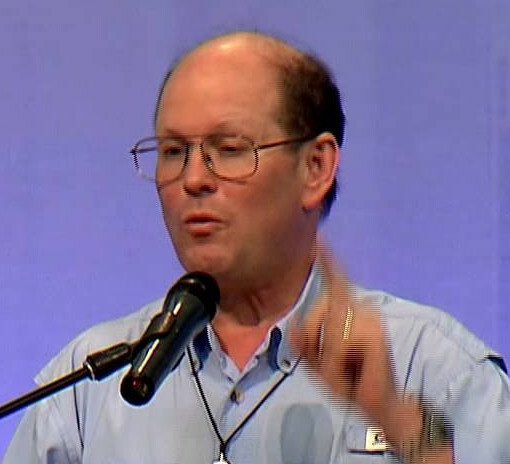 I invite you to spend 2 minutes listening to Catholic evangelist Steve Ray share a startling insight he had about this as he began to look seriously at the Catholic Church while he was still a Baptist. This is an excerpt of a talk that Steve gave at the Agana Cathedral Basilica in Guam in 2006. Read more. Exactly! Thank you, Charles, for this. Using the same example given by Steve, the NCW practices the art of bonshai, which consists in preserving an adult three in an artificial extra small size. Sorry because I can not better words to explain it without a dictionary. In Spanish, cultivar árboles en miniatura. Something totally artificial, very decorative, but against normal natural growth. The adult faith given by a whole life in the Way is not the normal faith, it is a creation of Kiko. Thank you for sharing Chuck! Reaffirming. The NCW concept of small communities was never Jesus's intent for the Church. Christianity was a persecuted religion and practiced their worship in small groups in homes and in the catacombs in safety from authority of the time. Jesus himself however gives us an insight of how this Kingdom that he founded and through the Holy Spirit will spread in the world grows from one man to what we now see as the Church in the world today. The Gospel passage tells us "The kingdom of heaven is like a grain of mustard seed which a man took and sowed in his field; it is the smallest of all seeds, but when it has grown it is the greatest of shrubs and becomes a tree, so that the birds of the air come and make nests in its branches." Matt 13:31-32, Jesus also did not intend for the church to be divided, but to be one in unity, "I do not pray for these only, but also for those who believe in me through their word, that they may all be one; even as thou, Father, art in me, and I in thee, that they also may be in us, so that the world may believe that thou hast sent me." Jn 17: 20-21. Why Kiko would want to mimic the early small Christian communities goes against the plan of God for his Church, Kiko appears to insert his interpretation of what the Church should be, and perhaps is why we see some of his doctrinal deviations in Sacred Tradition the Liturgy, Prayers, Creed's of the Church. His outlook of man's dignity, his concept of sin, the Sacraments are all showing signs of deviation from orthodox Church Teaching. I agree and thank you, Anon 9:19, and Chuck for this great reminder of God’s salvific plan for us, which includes his design of the Church. That design doesn’t include small and secretive communities. I’ll go even further back than Matthew and John cited by Anon 9:19, with Gen 12: 2 “I will make you into a great nation …” and Gen 15:5: "Now look toward the heavens, and count the stars, if you are able to count them." And He said to him, "So shall your descendants be." The design of the NCW comprising of small communities is, as is the point in Chuck’s piece, moving the Church backwards, keeping it stagnant. The Church is designed by God to grow and thrive from an acorn to a huge oak. To be able to grow and thrive requires, among others, inclusiveness and open-ness … and, in the case of a tree, the light of the sun and the nourishing elements of water and soil. All of these characteristics of Church are absent in the design of the NCW program. It is exclusive, secretive, lacks light, lacks nourishment to the mind and heart. And why the size of small communities? Because in small communities, members are easier to control, manipulate, and brainwash. And easier to shame members into surrendering their monies and assets to their communities for the benefit of Kiko and the pastors, bishops, and cardinals he pays-off to keep the NCW in existence. In existence not to deepen its members' faith, but to continue its money laundering enterprise. I thought he gave the talk at UOG Fieldhouse. I didnt know he did one also at the Cathedral. The one at the Fieldhouse closed with a celebration of the mass. Hello Ebet, sessions at the Cathedral Basilica were added by popular demand after he spoke at the fieldhouse. That's where I recorded him, because I was working for KOLG at the time, which is based upstairs. Question: Has what was once the mustard seed continued to grow after Vatican Council II? In many ways, the statistics are not good, most notably in the developed West. That's because the Church has been largely going in for fatalistic Teihardian nonsense altogether, NCW or no NCW, enabling the NCW to sell a more expensive, posher kind of junk food, as the supposed antithesis. Lapaz, the personaslities of my acquaintances who have been in the "Way" have become stunted. 9.19 and Rose, spiritual direction was never meant to be in groups - one person needs chalk and the next needs cheese. There is no such thing as a "community of communities" - my relationship with parishioners is through me not anyone else. The concepts of guarantors and covenants are invalid in all versions of Scripture and Tradition while "responsibles" are there solely to arrange the time and venue for proceedings and oh, they should account for the takings better. In a small enough group especially if sort-of sworn to sort-of secrecy, the rumours will hardly ever get out about the abuse of couples using NFP and the singling out of particularly vulnerable-looking people for constructive exclusion. 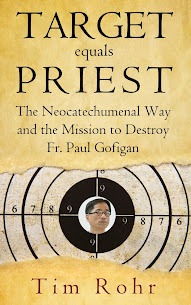 I've also - unusually for a NCW member or a Catholic - experienced "restorationism" and "primitivism" and the evils are potentially the same as in the NCW with the sole exception that the alleged heavyweight "moral" authority of bishops, archbishops, Popes, Vatican dicasteries, miscellaneous writings (including good ones) such as Charles de Foucauld, Dietrich Bonhoeffer, Isaac of Gaza etc etc can't be wheeled in to "back it up" (not that that's sufficient protection for some poor souls in backwoods I read about). In the cases I've personally known, the leaders and members concerned were actually too genuine to tolerate such serious evils. Thank you Mr. White. The videos of Fr. Mike Schmidt and Steve Ray,to which you referred to and available on You Tube, were most enlightening and should be shared with as many people as possible.